Take Narita Express to Musashi-Kosugi Station. Change onto JR Yokosuka Line bounded for either Kurihama or Zushi and get off at Shin-Kawasaki Station (next stop, 3minutes). Take Airport Limousine Bus bounded for Keikyu EX Inn Shinagawa (Shinagawa Station West Exit). At Shinagawa station, take JR Yokosuka Line bounded for either Kurihama or Zushi leaving from track No. Take Keikyu Airport Line to Shinagawa (approx. 15 minutes). 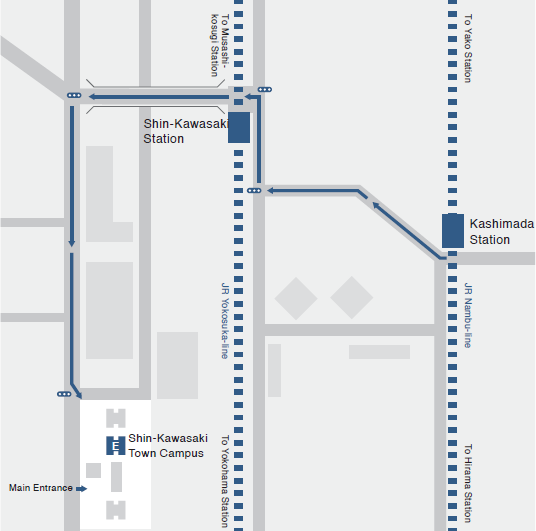 Change onto JR Yokosuka Line bounded for Kurihama or Zushi on Track No.15 and get off at Shin-Kawasaki Station (approx.15 minutes). Take Airport Bus leaving from No.15 on the ground level to Musashi-Kosugi Station.